Hi there! 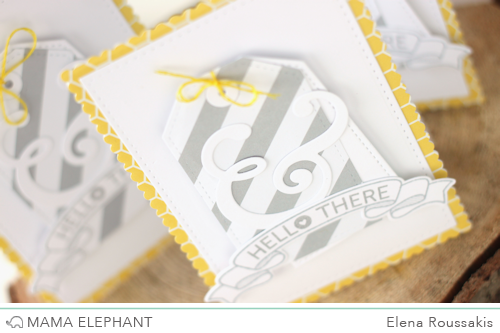 I'm on the Mama Elephant blog today with a monogrammed card set. I know what you're thinking: that's an ampersand, silly. It could also look like an "E" from where I'm sitting. Either way, I think this card set is super cute. Yellow and grey look as pretty together as they ever did. The new index card die set features smaller versions of the femme frames, perfect for creating a notecard set with a taggy focal point. 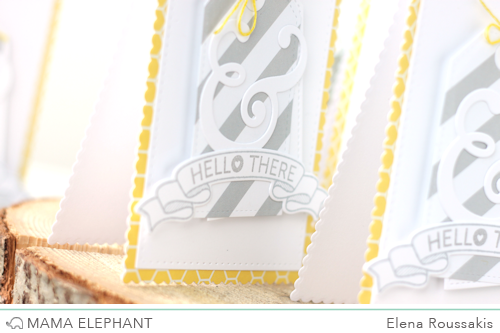 I love how the "hello there" sentiment fits so perfectly into the bloomsies banner! I hope you like my, er, monogrammed notecard set. Thanks for stopping by! 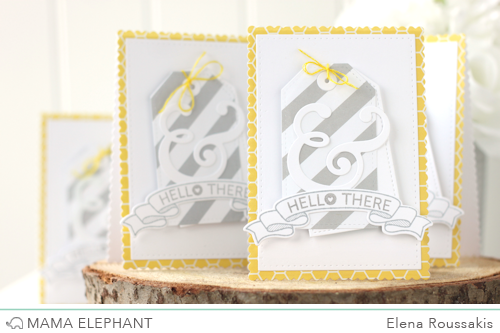 Love the striped gray tag and the yellow accents! It's all about E for Elena! ha! They really are pretty, and it works either way. This totally works as an "e"! Fabulous cards, Elena!